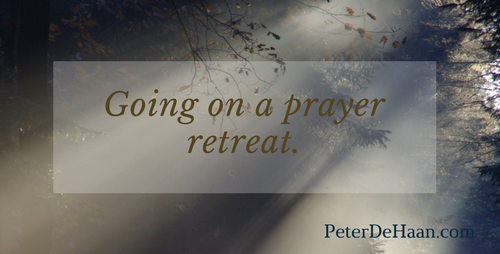 Last August, I went on a 24-hour prayer retreat. I had scheduled it at the beginning of summer, picking the optimum day amongst a calendar of prior commitments and a busy work schedule. I anticipated the day with much excitement but some trepidation, looking forward to what God would have in store for me as I sought him. Many events would conspire to thwart my attempts to arrive at the designated place to begin my sojourn. At several times I had to fight a strong and insistent compulsion to abort my mission. Gratefully, I did not. Even once there, it took a few hours to quite my racing mind enough to be able to seek God and listen to his gentle words. My diligence and persistence paid off. It was a significant time of spiritual enlightenment and divine encounter. At the end of my 24 hours, I was not ready to leave and even lingered for a few more. As I drove home, thinking of the work that awaited me there, I was already planning my next retreat. Could it be a quarterly event? I desired that to be the case, but here it is, almost a year later and another prayer retreat is yet to be planned. In some respects, the attacks that preceded my retreat are a bit off-putting. Plus, there is a nagging fear that a second time would pale in comparison to the first. But the reality is that I failed to plan. I let the minutia of each day, each week, and each month obscure a better and higher goal: to block out quality time to spend with God. Granted, I do this incrementally throughout each day and on a smaller scale when I fast (almost) every week, but that pales in comparison to a full day focused on God. I want to do this again. I need to do this again, but when will I do this again?